Marie completed her Articles at Maddocks (then known as Maddock Lonie and Chisholm ) and then spent a short time at Ryan Carlisle Thomas before coming to the Bar. She signed the Bar Roll in 1992 and quickly developed a busy practice, appearing in all jurisdictions. Marie recently returned to the Bar after a brief time away on family leave. 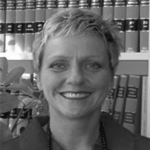 She practices predominately in the areas of Wills, Probate, TFM and general Commercial law.